Eric Wittenberg recently made a very interesting post in his series of Forgotten American Cavalrymen of Brig. Gen. Louis H. Carpenter. In the November 1888 issue of the Journal of the U.S. Cavalry Association (my readers will recall it’s one of my favorite sources) Carpenter wrote a very revealing and detailed piece about how cavalry prepares to fight dismounted. Mike Nugent passed the piece on to me, reminding me of this great description. Most folks who have read about actions in which cavalry fought dismounted are familiar with the generalization that one cavalryman held the horses of three of his comrades in the rear, while those three comrades skirmished dismounted at the front. However, the procedure was very specific and regulated. When a column or line of cavalry came on the scene, which troopers would dismount and which troopers would be horse-holders was determined very quickly, as you’ll see below. The description, in fact, will likely remind you of your days in gym class when everyone “counted off” in, say, fours. Think of that, and you’ll be able to easily picture the scene that Carpenter paints below. In less than half a minute a troop could dismount and deploy as skirmishers. Sometimes the line would be reinforced to about one man to the yard, but never heavier, and this answered all purposes. It is surprising when we consider how much was accomplished by this long, thin, apparently weak line of carbineers. How steadily it could advance under heavy fire, or deliberately retire, flexible, bending, but rarely breaking, keeping up its continuity, and showing a wonderful power of resistance… The soldier becoming accustomed to losing the touch of his comrade, became more self-reliant and dependent upon his own resources, taking advantage of all the over and shelter possible, and more difficult to be persuaded that he was whipped… Reserves and supports were provided for, and kept in hand to render timely aid and to be sent in when necessary. When the cavalry was dismounted, the horses were sent to the rear to take advantage of the nearest shelter from the enemy’s fire, No. 4 having no difficulty in managing the three horses entrusted to him, or in moving them from place to place at any gait. In case a retreat became necessary, portions of the dismounted men would fall back alternately, taking new positions in rear, assisted by artillery, until it was possible to mount and retire without interference; or, in other cases, some of the line would be withdrawn and mounted, and then deployed as skirmishers to cover the retreat of the remained, with mounted charges made occasionally on the flanks or front. So whenever you read about cavalry conducting a skirmish, cover action, or fighting withdrawal dismounted, just think of this wonderful description and it will help you picture both the standard procedure and the effectiveness of the maneuvers. As promised, and as we approach the anniversary of the Gettysburg battle, here’s another profile. 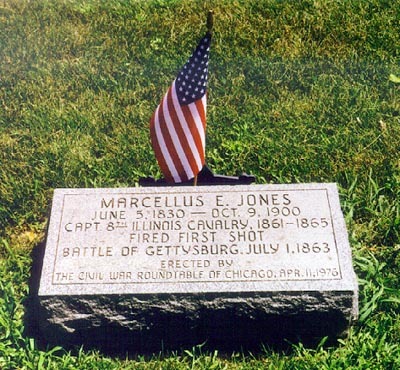 This is of Marcellus Jones of the 8th Illinois Cavalry, the officer in Col. William Gamble’s brigade (Buford’s division) credited with firing the “first shot” of the battle on the morning of July 1, 1863 against massed Confederate troops. In the July 2006 issue of America’s Civil War magazine, my feature article “Opening the Ball at Gettysburg: The Shot that Rang for 50 Years” (click to read the online version) featured detail on Jones, his shot, and all known claimants to that distinction. To nearly any student of the Battle of Gettysburg, Lieutenant Marcellus Ephraim Jones of Company E, 8th Illinois Cavalry, is known as the Union trooper who fired the first shot of the battle at advancing Confederate infantry along the Chambersburg Pike. Jones was commanding an advance vedette post at the intersection of the Pike and Knoxlyn Road, west of town, when he fired a borrowed carbine at a target some 700 yards away, thus opening the great battle that July 1st morning in 1863. Jones was described in the “Portrait and Biographical Record of DuPage and Cook Counties, Illinois (1894)” as “…one of the valiant defenders of the Old Flag during the late war.” Jones was born in Poultney, Rutland County, Vermont, on June 5, 1830, a son of Ephraim and Sophia (Page) Jones. On his father’s side, he appears to be descended from Captain John Stark of Revolutionary War note (and not the “General John Stark” as is the lineage commonly encountered – they were two different soldiers). Jones’ father, Ephraim, was a wagon maker by trade. Spending his entire life in Vermont, the elder Jones was killed during a severe tornado in 1858 when the timbers of a barn, in which he was taking refuge, fell on him. Ephraim and Sophia had seven children: Marcellus, Frank, Nelson, Libbie, Lola, Annis, and Henrietta. Brother Frank, who had been a hospital steward with the 14th Vermont Infantry in the Civil War, died in Dorset from illness in 1864. Marcellus, who grew up in Bennington and Rutland counties in Vermont, lived in that state until the age of 17, when he struck out as a traveling jewelry salesman with his horse and buggy. A year later he went to Niagara County NY, then to Medina County OH, spending a year and a half in those two locations working as a carpenter. On December 23, 1850, Jones arrived in Chicago IL and worked as a carpenter for four years. Moving to Weyauwega WS, he married Sarah Reece and worked as a carpenter, and also built a sash and door factory that was later destroyed by fire. The loss destroyed all his savings, some $4000. A son was born to Marcellus and Sarah, but the child lived only 13 days and Sarah died at about the same time. The newly-organized 8th formed at St. Charles IL and camped at Camp Kane, but received its drill and training at Washington DC, leaving for the city on October 13. Arriving on the 17th, the regiment camped at Meridian Hill, then went into camp near Alexandria VA on December 17th. The unit’s Lt. Colonel, William Gamble, was largely responsible for training it. The regiment would participate in numerous battles and skirmishes throughout 1862, and captured the colors of the 12th Virginia Confederate Cavalry at Poolsville. Jones was commissioned a 2nd Lieutenant on December 5, 1862, First Lieutenant July 4, 1864, and Captain on October 10, 1864. All three commissions were signed by Illinois Governor Richard Yates. Jones remarried on September 1, 1864. Naomi E. Mecham, daughter of Mathew and Phoebe, was described as one who “did what the rebels could not do – capture the Captain.” Mecham’s great-grandfather, who had settled in Massachusetts from England, had served in the Revolution. He eventually settled in Vermont, to which he had frequently traveled on hunting expeditions. A son, Seth Benson, served in the War of 1812. Mecham’s parents eventually settled in DuPage County in 1854 when Naomi was 12 years old. Until she married Jones, Mecham was a teacher and had attended Wheaton College. As soon as the war ended, Jones and his new wife located in Wheaton where he worked at his trade as a builder and house-mover. In 1872, the Joneses moved to Colorado and worked a ranch for four years. In 1876, they moved back to Wheaton permanently. Jones had built a home in 1865 on the southwest corner of Naperville and Indiana Streets in the town (this house still stands, having been moved to a new location a block away by a law firm that purchased and restored it in 1977). He is related as being one of a group of men who, after the war, had forcibly taken the county records from Naperville and helped to set up Wheaton as the new county seat. Jones served in various public positions in his post-war career; he served as Township Collector, City Councilman, and in 1882 was elected County Sheriff for four years. In 1890 he was appointed Postmaster by President Harrison. Jones was a prominent charter member of E.S. Kelley G.A.R. Post 513, and was its first Commander. He was a member of the Masons (of the Blue Lodge of Wheaton, Chapter of Naperville), as well as the Knights of Pythias and the Odd Fellows’ Society. Jones was described as a “stalwart Republican,” and that “his official, army and private life are alike above reproach.” Always remembered as the man who “fired the first shot at Gettysburg,” Jones remained a prominent member of the community and in Grand Army circles until his death on October 9, 1900. To memorialize the location of his “first shot” at the Gettysburg battle, Jones traveled to the spot in 1886 and placed a marker shaft made of Naperville Illinois Granite to memorialize his deed. This “First Shot Marker” sits today on the north side of Rt. 30 (Chambersburg Road) at its intersection with Knoxlyn Road.